If you thought fairy lights were cool, wait till you finish this recommendation of five Pinterest-worthy lamps and lanterns that are worth every penny of yours! Nerds and aspiring astronauts, we found the perfect lamp for you – Shaped like a rocket reaching for the moon, this lamp has a touch sensor control system helps in adjusting the brightness as per your requirement. Also, it’s quite enery saving and environmental friendly. Price: 1,599; Buy it here. 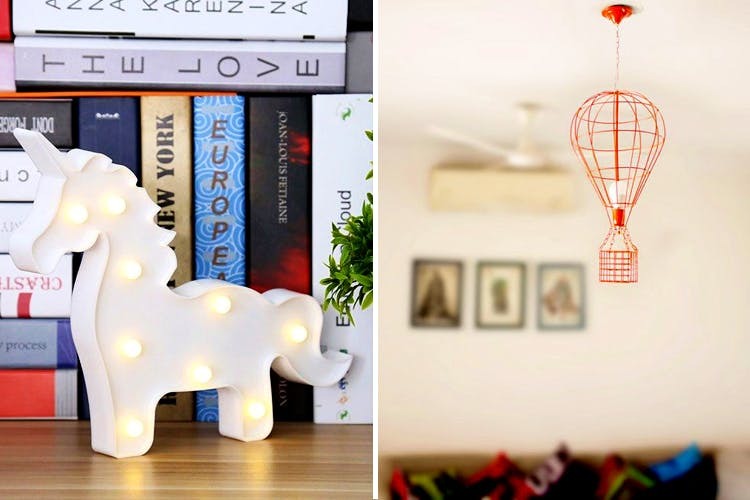 Believe in fairy tales or not, but you have to agree these unicorn lamps in shades of blue, pink, yellow and red are cutest thing ever. Place them on your work table or book rack, and you got a nice quaint space for yourself. Price: INR 899; Buy it here. Are you a traveler at heart? Then this quirky little hot air balloon hanging lamp in shiny vermillion will always remind you of all the adventures you’ve ever been on. Price: INR 2,700; Buy it here. Painted in pink and indigo, this one’s shaped like a house on a meadow. We recommend you hang this in your terrace garden, amidst climbers and bird cages for that perfect Instagram post! Price: INR 1,650; Buy it here. This suspension light is perfect for those who are lazy enough to get up at night to keep their book on the table or in the shelf. This unique lamp has a hangar sort of a thing where you can hang your book. Don’t worry it’s strong enough to hold big fat books too! Price: INR 8,500; Buy it here. Is the lamp broken or falling? Actually, none! This outlandish piece of lamp is for those who love abstract art and designs. Price: INR 8,437; Buy it here.